sweet what does it need? Glass for the sunroof - How the heck do you break one of those? CV replaced (I think thats what its called) I have a brand new axle that came with the car. exhaust system (entire) previous owner welded a glass pack to the converter - sounds awful and wont run well above 4000RPM - Back pressure issue?? Who knows. Needs body work - rear fender wells are RUSTY - passenger side is the worst - hope to learn how to weld as bondo just doesnt do it for me - other rust spots everywhere but not as bad as the wheel wells. I think there used to be chrome trim around the wheel wells (all 4) but not sure on that. new aftermarket radio - and an insert that isn't "Green Acred" into it. need service manual(s) maybe one for dummies? hell yeah! beat up old girls ftw! sh1t she needs a lot... but well worth the love! keep us posted on your restoration project man. I think so too - she certainly deserved more respect than the previous owner gave her..Oh well, she's home now and I got nothing but time. Hi Yogi - um I'm a real newby here so please forgive the stupidity. Whats a JRSC H22? He's saying you should drop an H22 (motor out of VTEC 4th gens and all 5th gen Preludes) and put a Jackson Racing Super Charger on it lol. which, really, would be the sh!t. Nice find & good luck to ya' on the build-up! good luck cant wait to see them pics, this would be even more amazing then the 2 gen with an h22 that was just posted. if you put a h22 in it , i think you kind of have to now. Wow, a wish you the best with restoring this 1st gen. Make sure you show us the final product. Thanks ALL for your well wishes, and for the encouragement..I have such a long, long road ahead of me..but thanks to you (all of you) it'll be OK. I've sanded the large spots of rust, ground down the small portions, discovered new ones and..oh god, bondo on the "original" body (EEK)!!! I have taken that down to the metal..or tried to..because I love this car. I have so many things to find and "fine tune", without each of you, this would be impossible..Thanks in advance!! I hope to pay that forward sometime soon. I know that I'm untrained, inexperienced, (some might even say stupid) but, I hope that my journey will be guided by all of you!..So, in advance, thank you, thank you each - for teaching me, for your patience, your ideas and for your creativity. It means the world to me. Last edited by Chopin2u; 04-27-2009 at 11:01 PM. Um, thank you for the info but 3 & 8 what- o'clock?? So if I shake them and they dont fall off theyre ok? No, um, crap...I don't know what a rod joint is..but thank you. I'll get my repair book soon so I don't seem like such a MORON...Thanks Bud, I really appreciate your time. yea o clock lol sry. 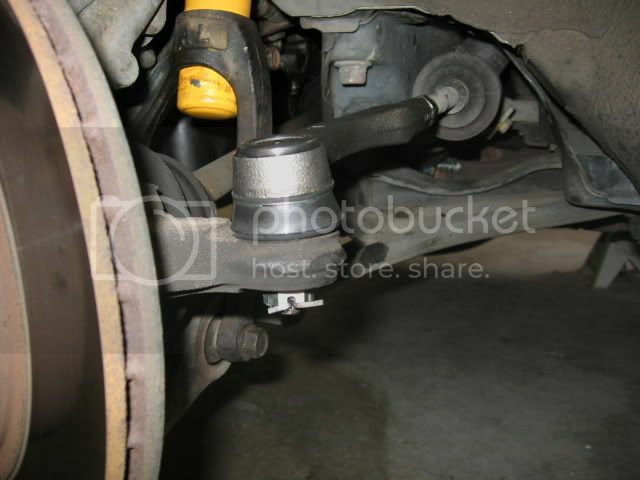 tie rod joint isnt really a technical term its just one from my imagination lmao....in these pictures you can see what im talking about. if there is any loose movement in either of those places when you shake the wheel it means they are bad. Hey - thank you so much for the pics - I cant wait to check them tomorrow! 3 & 8, if it shakes its bad..Is the top pic of one that's bad? Having never seen one I don't know by looking..The bottom one looks better to me but that's because I'm inexperienced. PS You have one HECK of a camera! I dont know if the top one is bad. I just got those pictures from the internet. They are similar to how the honda tie rod set up is and I think the 2nd picture is of a honda. The camera I have could indeed take such fine photographs though lmao.